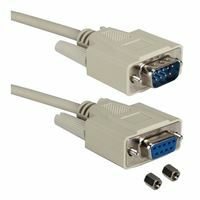 Extends any DB-9 cable. This multipurpose cable is fully-wired to support any serial printer, mouse, modem, switch, video splitter, mono & multisync video applications. QVS cables are UL listed, have matched impedance, PVC jacket, molded ends with thumbscrews and inner hood soldered 360 degrees to the connector for complete end to end shielding.